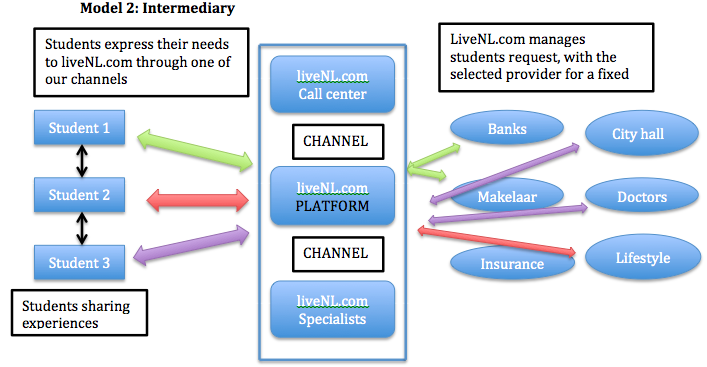 liveNL.com is a website which includes useful information and services for international students. Taking into consideration the key benefits of the consumption situation, and the opportunities in the current market we created a table analysis. This allowed us to scrutinize opportunities from which we may benefit from. We found needs that the current competition wasn’t serving. We also realized what our weaknesses are. This is of extreme importance, as we now know have a clearer idea of whom we are challenging. By discovering these unmet needs we purposely created two models to serve more consumers. The first model (facilitator) allows the international student to seek information without any charge. The second (intermediaries) offers consumers services in return of a fixed fee. Each model is applicable at a different stage of the consumer experience process. The models also differ in use of channels, investment, costs and benefits offered. However like this we managed to structure each model such that it maximizes the value of consumer for their intended stage. With the use of generated costs for the company and the consumers we calculated the utility equations for both models. The expenses we took under consideration for the company are the website development, operational, advertising and promotional costs. On the other hand, for consumers there are the monetary and time-based switching costs and the fixed fee. The utility functions helped us to receive a more theoretical approach to show how these models create value. In both scenarios the benefits outweigh the required costs. This reassures us that we are maximizing consumers’ utility, and adding value to their experience. To conclude we strongly believe that liveNL.com can improve the experience of international candidates when moving abroad. With this system we are able to motivate customers to be active with their search for preferred service providers. However if a more present role on our behalf is required, we can always step in to assist our customers, to add more value. We also incentivize communication, and not merely to socialize, but to share experiences. By doing so we can learn from each other’s mistakes, but help others to not make them. We’re indirectly creating a community of responsible users. We significantly improve the overall experience, and strive to make settling down in a country abroad more pleasant.